Colors: White, with any combination of lemon, orange, sable, grizzle or black markings. tricolour. Grand Basset Griffon Vendeens are, in size, the big brother to the more well-known Petit Basset Griffon Vendeen. They have many similarities. The biggest difference is in height, head size, and length of ears.�Actually,�in France there are 4 breeds of the Griffon Vendeens, all of�different sizes. The�Grand Griffon Vendeen, the Briquet Griffon Vendeen, and the two Basset types. 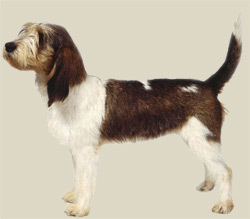 Not many generations back,�the two Basset types were same breed-the Basset Griffon Vendeen. The Grand Basset is a happy and confident dog with lots of�personality,�but most of all he is a hunter. Long Daily walks required. They are very energetic dogs and do not stay still for long. They love hunting.